Ebola is a virus that attacks a person blood system. 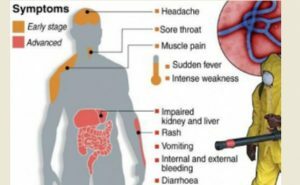 Ebola also known as Ebola hemorrhagic fever or Ebola Viral disease, is a rare and deadly illness caused by one of the strains of Ebola virus. This viral agent is regarded as a prototype pathogen of viral hemorrhagic fever, with high fatality rates in humans and primates. To know each and everything about Ebola such as " What is Ebola? it's Symptoms and Prevention " you can read the whole article..
Wash your hand with soap frequently. Avoid areas of known outbreaks. Blood, body fluids or tissue from an infected person. Ebola can spread in health care settings if staff do not wear proper protective equipment, such as ; masks, gowns, gloves. Ebola can also spread through contact with infected animals ; such as Bats, gorillas, monkeys. No-FDA approved vaccine or medicine (antiviral Drug) is available for Ebola. Symptoms of Ebola and complications are treated as they appear. the following basic interventions, when used early , can significantly improve the chances or survival. Providing intravenous fluids (IV) and balancing electrolytes ( body salts). Treating other infection if they occur.